It is the lower jaw bone. It has lower teeth and is the biggest, strongest and lowermost bone of the face. It is composed of 3 parts: a horizontally-oriented body and 2 vertically oriented rami and is horseshoe shaped bone. Superior border of the body is referred to as alveolar process. It bears sockets of lower 16 teeth. Inferior border or base of the mandible presents a small depression (digastric fossa) on either side near the median plane. It supplies connection to the anterior belly of the digastric. Symphysis menti (mentum = chin): It’s a dim median ridge on the external outermost layer of the body. It indicates the line of fusion of the 2 halves of the mandible in the age of 2 years. The symphysis menti grows below into a triangular elevation named mental protuberance. It creates the point of chin, the base of that is restricted on every side by the mental tubercle. The inner aspect of symphysis menti possesses 4 tubercles referred to as genial tubercles (mental spines) ordered into 2 pairs: upper and lower. The upper pair gives connection to genioglossus muscles and lower pair to geniohyoid muscles. Mental foramen: It is located below the time between the premolar teeth and gives passage to mental nerve and vessels. Oblique line: It’s the continuance of the anterior border of the ramus. It runs downwards and forwards in the direction of the mental tubercle. Incisive fossa: It’s a shallow depression just below the incisor teeth. Mylohyoid line is a notable oblique ridge that runs obliquely downwards and forwards from behind the third molar tooth (about 1 cm below the alveolar border) to the symphysis menti below the genial tubercles. Mylohyoid groove is located below the posterior end of the mylohyoid line. Mylohyoid nerve and vessels run in this groove. Buccinator: rises from oblique line below the 3 molar teeth. Mylohyoid: originates from mylohyoid line. Genioglossus: originates from superior genital tubercle. Geniohyoid: originates from inferior genital tubercle. Anterior belly of digastrics: appears from digastric fossa on the base of mandible close to symphysis menti. Platysma: added into the base. Superior constrictor: originates from the area above the posterior end of the mylohyoid line. It’s more or less a quadrilateral vertical plate of bone that projects upwards from the posterior part of the body. Superior (it’s notched to create mandibular notch). Condylar process, a powerful upward projection from posterosuperior part. Its upper end is enlarged to create head. Neck is the constricted part below head and presents a depression on its anterior surface referred to as pterygoid fovea. Coronoid process, a flattened (side to side) triangular projection from anterosuperior part. The meeting point between posterior and inferior edges of the ramus of mandible is named the angle of the mandible. 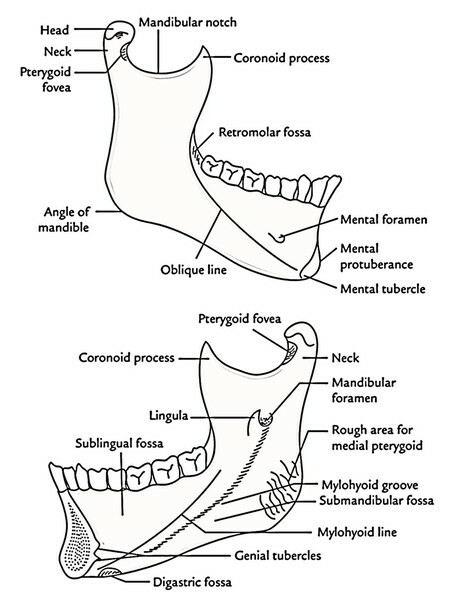 The features on the medial and lateral surfaces of the ramus of the mandible are shown in Figure below. The lateral surface of ramus is flat and bears a number of oblique ridges generated by masseter muscle. 1. Inferior alveolar nerve: a branch of the posterior section of the mandibular nerve. 2. Inferior alveolar artery: a branch from the first part of the maxillary artery. Lingula is a small tongue shaped projection on the anterior margin of the mandibular foramen. Mylohyoid groove starts just below the mandibular foramen and runs downwards and forwards to get to the body of mandible below the posterior part of mylohyoid line. Masseter is added into the outer outermost layer of the ramus. Temporalis is added into the coronoid process on this particular tip, anterior border and inner surface. Lateral pterygoid is added into the pterygoid fovea present in front of the neck of the mandible. Medial pterygoid is added into the inner outermost layer of the ramus above the angle of the mandible. 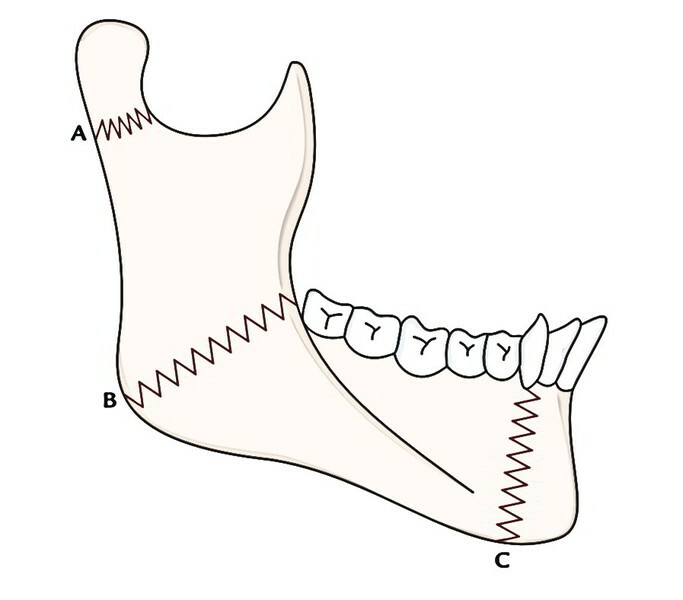 Stylomandibular ligament is connected to the angle of the mandible. Temporomandibular ligament is connected to the lateral aspect of the neck of the mandible. Sphenomandibular ligament is connected to the lingula of the mandible. Pterygomandibular raphe/ligament is connected behind the final molar tooth to the upper end of mylohyoid ine. Lingual nerve runs on the inner outermost layer of the body close to the medial side of the root of the third molar tooth. Inferior alveolar nerve enters the mandibular foramen and goes through the mandibular canal. Mylohyoid nerve runs in the mylohyoid groove. Mental nerve comes out of the mental foramen. Nerve to masseter (masseteric nerve) runs via the mandibular notch. Auriculotemporal runs to the medial side of the neck. Fringy mandibular nerve across the lower border of the mandible. Differences between male and female mandibles. At birth, it’s present below the sockets for deciduous molar teeth near the lower border. In an adult, it slowly moves upwards and opens midway between the upper and lower edges. In old age, it is located close to alveolar border because of resorption of alveolar process of the mandible because of loss of teeth. Distinguishing features of mandible in distinct age groups. The 2 halves of mandible fuse during the very first year of life. In babies and youngsters, the body of mandible is primarily composed of alveolar part consisting of sockets for both deciduous and permanent teeth. In adults, alveolar and subalveolar parts of the body of the mandible are equally developed. In old age, teeth normally fall out and alveolar border is absorbed so the height of the body is noticeably reduced. The mandible takes up a notable and exposed position of the facial skeleton; therefore it’s generally fractured following violent injuries. At the neck of the mandible, as this is actually the poorest part of the bone. At the angle of the mandible because here unexpected curvature focuses the power of the strike. In the canine region of the body because elongated root of canine tooth reduces the bony substance and makes the mandible poorer at this site. The canine region is the commonest site of the fracture. A fracture of the mandible normally includes two fractures one in every half of the mandible, viz. fracture neck of mandible on one side and fracture of body in canine region on the other side. 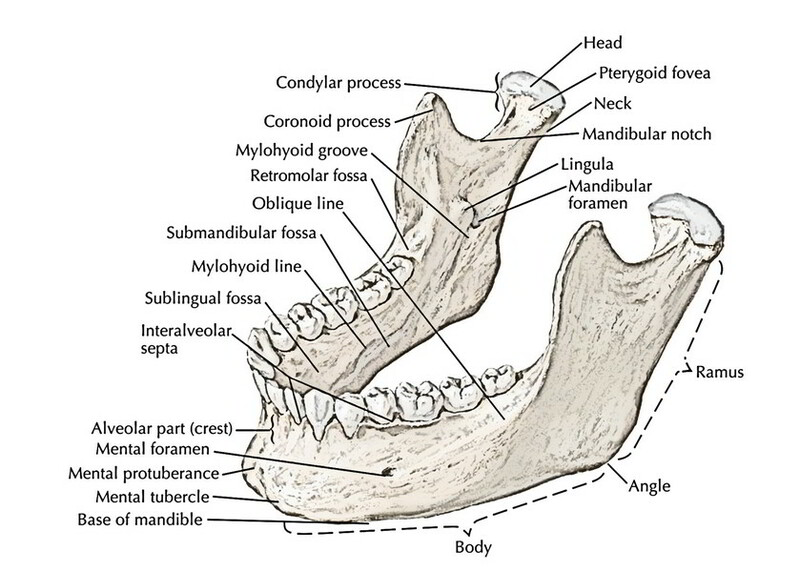 The mandible is composed by both intramembranous and endochondral ossification. Part of the mandible between mental and mandibular foramina ossifies in membrane from mesenchymal sheath of Meckel’s cartilage (first arch cartilage). Part of the mandible medial to mental foramen ossifies directly from Meckel’s cartilage (endochondral ossification). Coronoid and condylar processes ossify from secondary cartilages not related to Meckel’s cartilage. The mandible is the next bone to ossify in the body. The heart in the mesenchymal sheath of Meckel’s cartilage appears during the 7th week of intrauterine life. The other centers creating the mandible appear during the 10th week of intrauterine life. At birth, mandible is composed of 2 halves joined in the symphysis menti by cartilaginous nodules (mental ossicles). The bony union begins with below upwards during the first year of the age and finished at the end of the second year.